Tianjin, called Jin for short, which is a municipality of the People’s Republic of China, acts as a national central city, economic center of Northern China, economic center of the Circum-Bohai-Sea Region, international shipping center in Northern China, international logistics center of Northern China, international port city and ecological city, international shipping financing center, Chinese traditional medicine R&D center and Asia-Pacific regional marine instrument testing evaluation center. Tianjin, called Jin for short, which is a municipality of the People’s Republic of China, acts as a national central city, economic center of Northern China, economic center of the Circum-Bohai-Sea Region, international shipping center in Northern China, international logistics center of Northern China, international port city and ecological city, international shipping financing center, Chinese traditional medicine R&D center and Asia-Pacific regional marine instrument testing evaluation center. Located in the northern part of North China Plain. 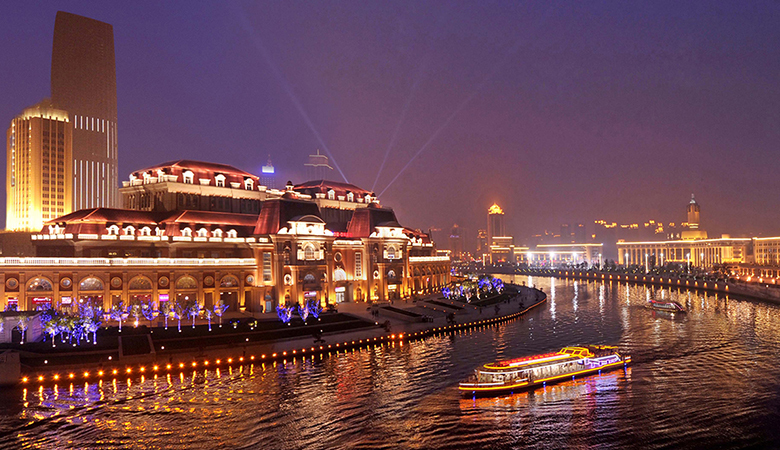 Tianjin has been enjoying its prosperity by water transport since the ancient times. 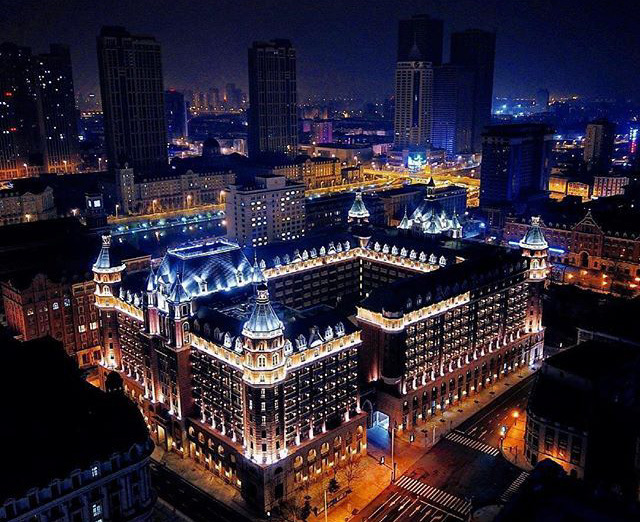 Tianjin was officially founded on November 21 of the second year of the reign of Emperor Yongle in Ming Dynasty (December 23, 1404), which was the only city with an exact founding record in ancient China. During the past over 600 years, a unique urban landscape has been created in combination with Chinese-Western styles and ancient-modern styles. The city covers a total area of? 11,760.26 square kilometers, with a population of approximately 14 million. The downtown is located at 117°10’E, 39°10’N. Located in the northern part of the North China Plain, Tianjin faces the Bohai Sea on the east and adjoins Yan Mountains on the north. Situated in the lower reaches of and spanning across the both sides of Haihe River, Tianjin is the key position for railways to Northeast China and East China and also an important port for ocean shipping port, which is renowned as a “hub of the river and sea” and a “gateway to the capital”. Stretching from Huangya Pass of Ji County in the north to Changlang Canal located in Zhaizhuangzi Village of Binhai New Area, Tianjin has a south-to-north length of 189 km; running from Xigan Canal lying on the east of Saxituo Village of Binhai New Area in the east to Tandegan Canal lying on the west of Wangjinzhuang Village of Jinhai County in the west, Tianjian has an east-to-west width of 117 km. The territorial circumference of Tianjin is about 1,290.8 km, with coastlines of 153 km long and land border of 1137.48 km long. In addition, Tianjin adjoins Tangshan, Chengde, Langfang and Cangzhou in Hebei Province respectively on the east, west and south. 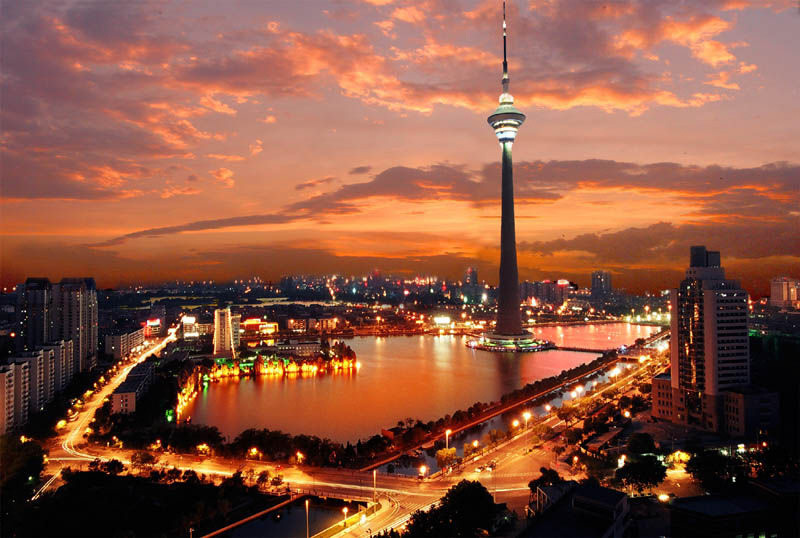 Located in the north temperate zone and on the east coast of the mid-latitude region of the Eurasian Continent, Tianjin is mainly subject to the monsoon circulation, and is a region where the east Asian monsoon prevails and that enjoys the semi-humid monsoon climate in the warm temperate zone. As Tianjin is located adjacent to the Bohai Bay, the city is significantly influenced by ocean climates featuring four distinct seasons, windy and dry spring, hot summer with concentrated rainfall, crisp and pleasantly fresh autumn and cold winter with light snow. Therefore, late spring, early summer and the whole autumn are the best seasons to travel in Tianjin. Northwest wind prevails in winter half year with low temperatures and less precipitation; the Pacific subtropical high becomes stronger in summer half year, thus the southerly wind prevails with high temperature and more precipitation. Sometimes spring drought may occur. The annual average temperature is about 14 ℃, hottest in July and coldest in January. The average monthly temperature is 28℃, and the highest temperature in history is 41.6℃. January is the coldest month with an average temperature of -2℃. The historical lowest temperature is -17.8℃. The annual average precipitation is 360mm to 970mm, and the average precipitation is below 600mm. Tianjin is a place where a variety of folk arts are originated, prospered and developed. Comic dialogue and Beijing opera are the important representatives of Tianjin’s folk arts. Music and literature have intermittently reflected Tianjin’s geographical and cultural characteristics. At present, like other places in mainland China, Tianjin has five kinds of government-admitted religion, namely Buddhism, Taoism, Islam, Catholicism and Protestantism. Buddhism and Taoism were introduced into China long ago, and Islam was introduced when Tianjin newly came into a settlement during the Yuan Dynasty. Tianjin, but the periods are short. Tianjin is hot and rainy in summer, dry and cold in winter. These two seasons may not be the best time to tour Tianjin. Tianjin has different sorts of scenery in different seasons. It has a mild climate in spring and autumn. Summer is the rainy season. Tour to Mount Pan in spring Spring is the season of rebirth. In spring, we can go climbing, take a breath of fresh air and do physical activities, through which we can keep ourselves in a good mood accompanied by the sunshine. In Tianjin, the best choice is to tour in Mount Pan. We can start climbing from the western path, where we can see the mountain takes on three dishes: upper, middle and lower. The three dishes have their unique features: the upper dish is covered with pine trees, the lower dish is scattered with stones and the lower dish has a number of rivers and brooks, which are known as the “landscape of three dishes”. If time permits, you can also visit the Dule Temple at the foot of Mount Pan situated in Ji County. Drinks in summer Each summer, Tianjin will hold a large beer event on schedule, during which you can enjoy yourself in watching the scenery in the daytime, and drink to your heart’s content in the evening while watching the dance and enjoying a perfect summer. Beautiful scenery in autumn Autumn is certainly elected as the best tourist season in Tianjin, as you can watch the Bohai Sea in the east, enjoy the folk customs in the west, admire the ecological landscape in the south and visit Yuyang in the north. Besides, you can also enjoy yourself in the downtown. 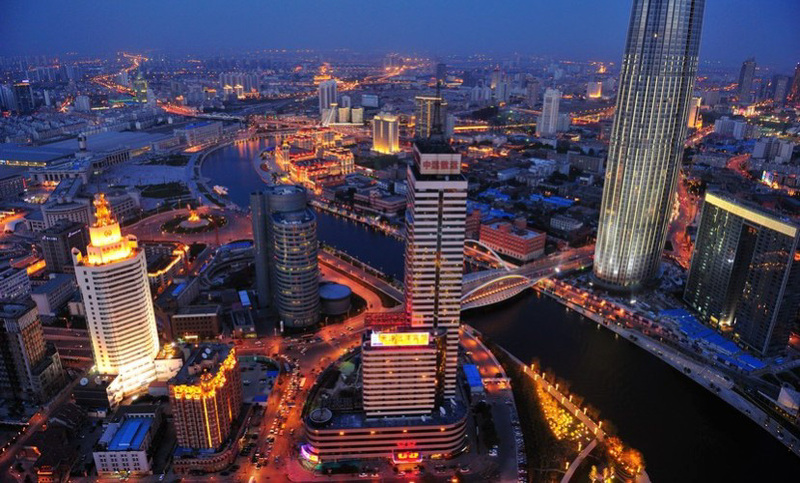 For Tianjin in autumn, tourism is the only topic. Enjoy hot springs in winter There are many hot springs in Tianjin: Dijing Hot Springs Resort, Dongli Lake Hot Springs Resort, Tianjin Shuishang Hot Springs Garden, Tianjin Baodi Hot Springs Resort. In the north, it has become a kind of fashion to soak in a hot spring in cold winter.